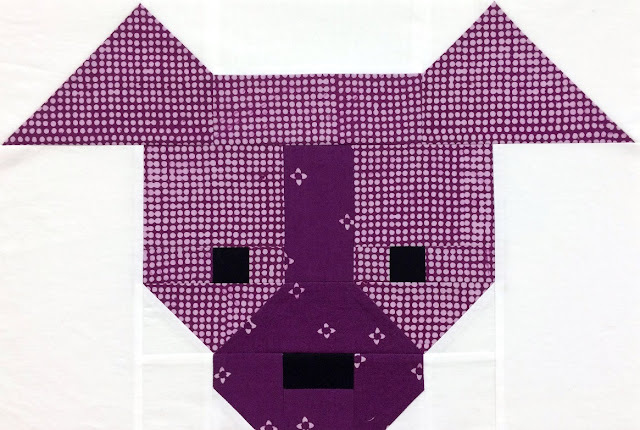 When Ann of Brown Paw's Quilting requested any one do Lorna's Dog Gone Cute blocks, I was happy to piece one of them, well, because they ARE dog gone cute! Ann was queen bee for August for the Bee Inspired international bee and requested that we make the the large size blocks which measure 18" x 12". I made Block #5 and approached the piecing the same way as I made the poodle block. I printed out the cutting chart and photo of the block and that was all I needed to complete the block. Scraps of purple Hoffman batiks from making Well Rounded Single Girl were used to make the block. The background is even a batik in zinc from Hoffman Indah Solids. I'll leave you with a picture of my favorite dog Dingo, on the left, and Dixie. These were taken in 2008 and both have now gone to doggie heaven. At the time, Dixie was little and my husband made her a little ramp so she could easily walk right up to get in the bed of the truck. 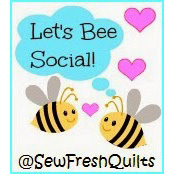 Linking to Let's Bee Social #196 with Lorna at Sew Fresh Quilts. Love your block. I made a quilt when Lorna first had her QAL - it was such fun! Love all three of the dogs! Lorna's patterns are fun to make. She spoke at our guild last fall and I did a workshop with her. What a cute block and doggies!! I have always loved the puppy block, nice job Paige! Cute purple puppy! Your dogs were cute, too. You must miss them; I sure miss our fluffy white girl. We've decided we'll stick with cats on the boat, though. The logistics of getting a dog ashore for a walk can be daunting sometimes. A purple dog--too cute! I know you must miss your Dixie and Dingo--they look like very sweet dogs! Lovely cute block Paige, I do like your colours. I wish my dogs looked as chilled out in the car. What a sweet block and memories of sweet dogs, Paige. All of your dogs are beautiful, Paige. 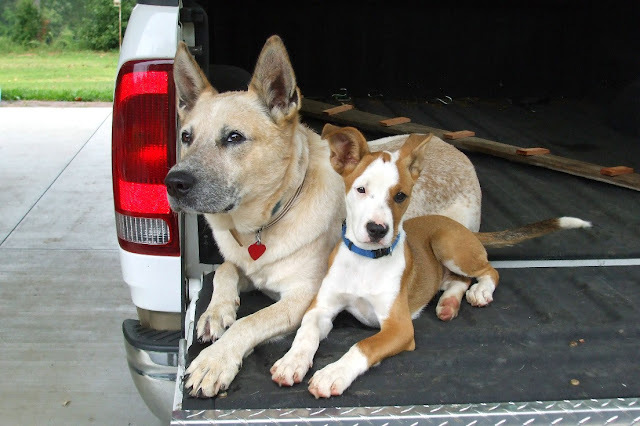 Thanks for sharing the photos of Dixie and Dingo. Such cuties! Dingo and Dixie, a lovely finish to your post today, and purple, grand colour for the block. Doggie Heaven will be all the richer for their arrivals those years ago. Great block Paige! I love the fabrics. And I love your real-life dogs. 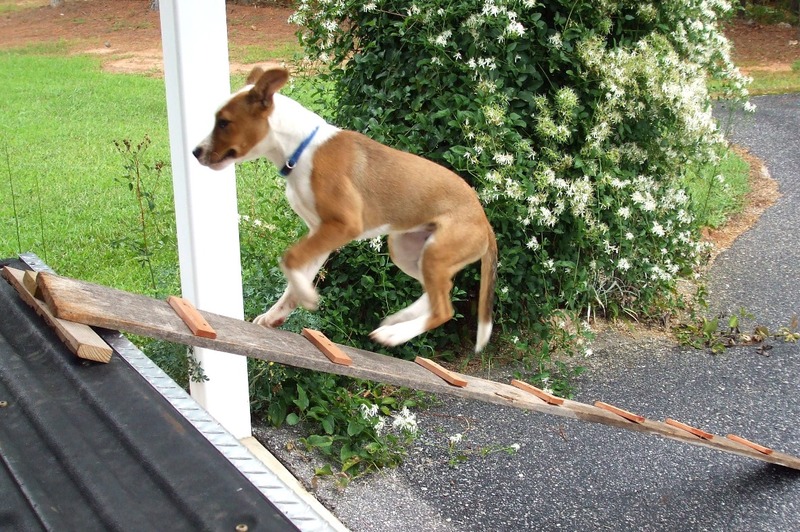 Dixie on that ramp is too cute! 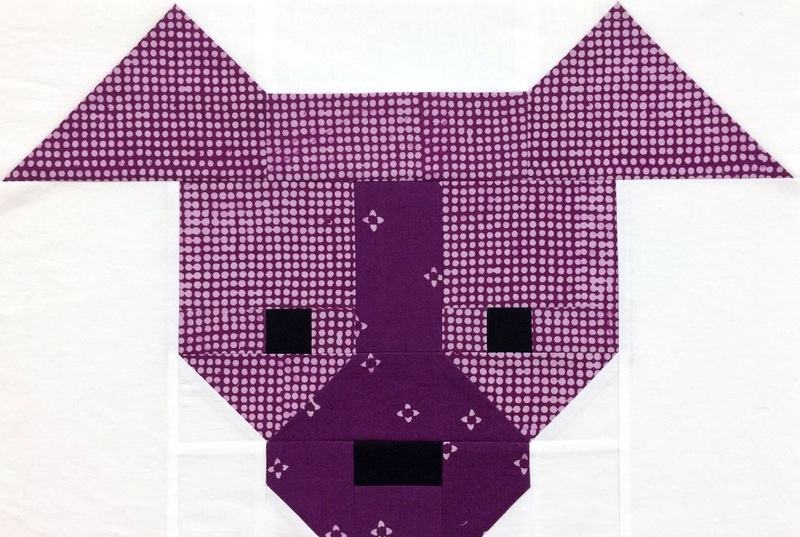 I could look at Dog Gone blocks all day, because they are so stinking cute :) Love this one in lovely purples. Dixie looks like she was flying up the ramp in that picture. Lorna's block designs are so inspiring!! What a cute doggy block! Love that you were "brave" to make the dog in a different color. I take designs like this too literally! Your dogs were adorable. I bet you miss them. I love your block - such fun colours! I made a pillow for my daughter-in-law a couple of years ago for Christmas using that pattern and i've been wanting to make a whole quilt ever since! I love your purple puppy! And that truck ramp is a hoot!